Its been over 15 years since Malcom Willis' seminal work Genetics of the Dog was published. And, unless you are Rip Van Winkle, you know that much has happened in the field of genetics in those 15 years. It seems like we daily hear of advances in DNA research such as genetic markers.. Gradually, the mysteries of DNA are being unraveled. 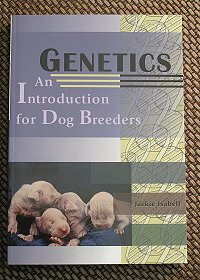 Genetics, An Introduction for Dog Breeders by Jackie Isabell fills a valuable need for a current work on dog genetics. As stated on the book jacket: "The dog breeder who understands genetics has a better chance of consistently producing sound, health puppies with desired breed temperament and aptitude and with fewer undesired genetic traits. An awareness of the intricate patterns of heredity is the only way to begin to realize why traits don't always fall into predictable dominant-recessive patterns. Yet, many breeders find understanding and applying these principles too challenging to attempt. Isabell hopes to reverse this trend by providing dog breeders with a comprehensive yet easy-to-understand guide." "Understanding that there are varying degrees of dominance, polygenes, modifiers, and environmental effects enables breeders to select breeding-quality individuals and to plan matings that improve the chances of achieving their goals." Having ready access to a university library, I have read a handful of canine genetics books. In my quest for information, I have endured many hours of having my eyes glaze over - not a genetic disorder per se, but one caused by genetics. Isabell's book is the first that I have seen that is does not immediately induce this problem, while in a practical sense, seems complete. I asked Mindy Mymudes, the moderator of the spanielgenes yahoo discussion group for her impression on the book. She responded: "I adore the book. I think it is well enough written that it doesn't bore science oriented individuals, without being so highbrow as to be incomprehensible." Isabell has accomplished much with this book, and with periodic revision, it will become a standard reference among dog breeders. Indeed, for the spanielgenes group, it has been adopted as their current study guide. This is an important book. 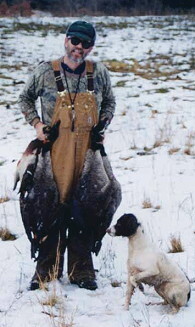 With advances in health checks and database records for spaniels such as OFA, CERF and the DNA test for PFK, we have opportunities in breeding than no generation before us has ever had. Knowing how to apply this knowledge is critical for breeder and buyer alike. I would strongly suggest that this book belongs on the shelf of every serious spaniel owner.